Stunning Paola with her gorgeous smile .. Witty MC … Marcel ..
… daughter checking dad’s wallet ..
.. yay!!! daughter finds the means to buy shooters !!!! A picnic at Warwick Wine Estate was next, where they were introduced to the Wedding Cup .. (not the best pic – it was taken when hubby and I went to Warwick in March this year) ..
Princess Kunigunde fell in love with a young, handsome and ambitious Silversmith. Although Kunigunde`s father did not approve of their love, it was clear that she only wanted the Silversmith to be her husband. The King became so enraged that he had the young Silversmith thrown into the deepest darkest dungeon. Not even his daughter`s bitter tears would change her father`s mind. To her father`s dismay, imprisoning the young man did not end his daughter`s love for the Silversmith. Instead, he could only watch as his daughter grew paler and paler as a result of the separation from her true love. The King and Queen reluctantly made the following proposal: He told his daughter, “If your Silversmith can make a chalice from which two people can drink at the same time without spilling one single drop, I will free him and you shall become his bride”. Of course he was certain nobody could perform such a task. 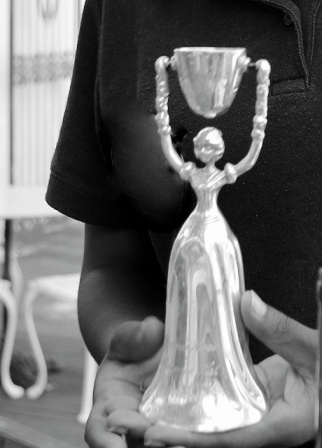 Inspired by love and with skillful hands, the young Silversmith created a masterpiece. He sculpted a girl with a smile as beautiful as his own true love`s. Her skirt was hollowed to serve as a cup. Her raised arms held a chalice that swivels so that it could be filled and then swung towards another. The challenge was met. The Silversmith and the Princess joined hands in marriage and with the bridal cup set forth a romantic and memorable tradition as charming today as it was originally hundreds of years ago. To this day and to many couples the chalice remains a symbol of their love. Happiness and good fortune await the couple who drink from this cup. Princess Kunigunde and the Silversmith lived happily ever after. Speeches by the two best men, Lee and Richard, Nigel – Bryan’s dad, and lastly by the groom himself ..
One more pic … the photo booth was great fun !!! !